Update your bedroom dressers or drawers with these beautiful, heavy 3.5-inch oil-rubbed bronze twisted drawer knobs and pulls. Attractive, durable, and ideal for use as an accent for bathroom cabinetry or furniture. The design gives these pulls an easy-to-grasp feature so you won't have any issues opening your cabinets. These have a substantial weight and size. I used them with a similar color oil rubbed bronze knob and they look great. Really dress up the room. I am renovating a 1915 house. These were used on a cabinet and desk that were custom built in the room already. The desk and cabinet were very plain so these dress it up. I am also using them on cabinets, vanity, and closet in the bathroom. My contractor is in his 50s and said he has never seem knobs like them and he was very impressed. Took picture with a hanger to try and give you some scale. They are large but definitely not too large for kitchen or small bathroom cabinet. Great price for such a substantial knob. However, the ends screw off which is a royal pain. You would not know that by looking at the picture. There is literally no way to prevent this from happening on knobs that get daily use. Other than that - the Tuscan design is simply gorgeous and truly takes a basic cabinet door/drawer to another level. Pay attention to the size - they don't work on drawers that are close together as you cannot open due to projection of knobs. 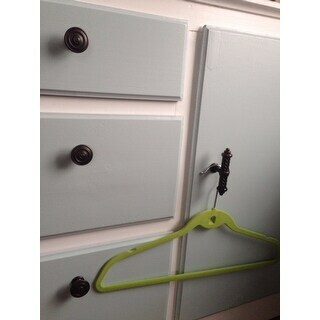 I mixed these with GlideRite knobs on my drawers and used these pulls on my cabinet doors. Worked perfectly together. These drawer pulls are going to replace my current birdcage knobs in silver. 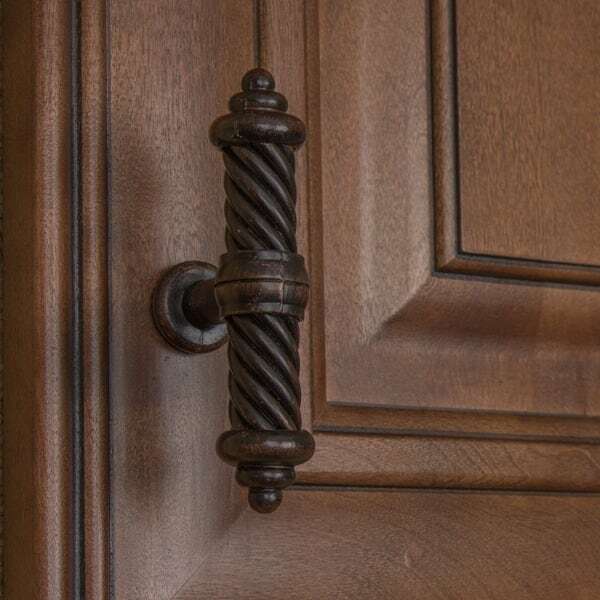 I love the size and weight of these bronze knobs...the style has an elegant appearance. I chose this particular knob because I currently have only one hole on each cabinet, but these knobs will give the feel and appearance of a larger pull without drilling the additional hole. I was pleasantly surprised when I received this hardware. The product is sturdy, great quality, and looks to be like hardware you would see in high quality built custom homes. I shopped around several places for hardware and found this on Overstock. I ordered one bag to see if the quality and look were good. Needless to say I went back to order 3 more bags. Description says quantity comes in 10 but they are all individually packaged. This kept each hardware from scratching up against each other. 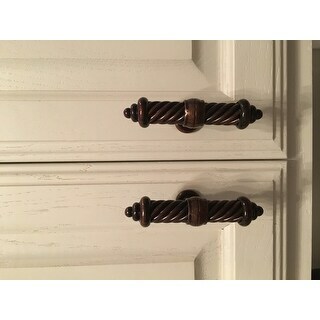 Love my cabinet hardware. Looks great on my cabinets. I used the small ones in my bathrooms and laundry area. I also ordered the 5 inch for my kitchen. These knobs are beautiful...I recently remodeled my home and used these knobs in my kitchen and bathrooms...used them as drawer pulls and cabinet pulls. These are heavy and a darker oil rubbed bronze which is what i wanted. We have not installed them yet but wanted to comment on how they feel and look. They look much more expensive than the price I paid here. Love the look of these drawer pulls, but we had to buy screws since the screws provided were not long enough to thread through our drawers. High end look for not a lot of money. Overall very happy with the end result. 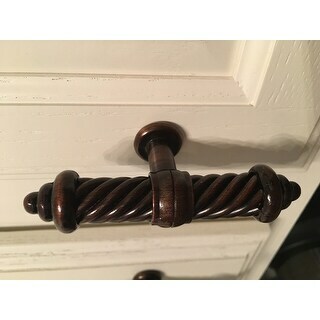 Purchased to use as closet door pulls. Easier to grasp than the round knobs. Works great. Nice quality. These are a nice quality and nice looking pull. However, they only work best on cabinets you don't use much. We have them on our kitchen cabinets and the cabinets we use a lot, the tops of pull come unscrewed. Also, The whole pull drops and it's dangeling. The welding for the middle section is not good. In addition, the screw that is provided to go through cabinet is cheap. Never thought a simple screw could be cheap. However, the pull will often rotate around and then when you go to tighten it, the whole pull breaks off leaving the broken screw in the pull so the pull is no longer functional. If I could upload photos I would show examples of all the above. Overall, I wish I could send back but I'm over my 30 days. We wanted cabinet pulls that would tie into the country french look we were striving for. These were perfect except for the color so we spray painted them and voila! the only complaint (minor one) is that the tips come in a bit loose and the pulls seem to loosen easily with use. I find myself straightening them more than I feel I should have to but I still love the look. 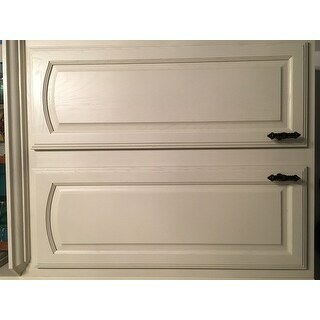 After shopping in stores and on-line for new kitchen cabinet pulls, I found these on Overstock. They are perfect for my new cabinet doors...really dress them up! Love, love the look, unique substantial on large cabinets. Someone noted the ends were loose - yes some were, easy to tighten. What is more frustrating is some are loose on the middle much harder to correct. For me the appearance out weighs the poor construction. I actually ordered them twice. I now have 60 of them in my house! Some may be a little off center so order a couple more than needed. I've had these less than a year and the ends screw off and you can't screw them back on. They are not made very well. Such a bummer. Such a great price for so many. Also great look & design. Popped my bathrooms cabinets with a nice clean look for upgrade. Thanks Overstock, you continue to have a new look that we are looking for at a great price and nicely made products! I purchased 30 of these and every one was perfect. I had seen this a while ago in a local retailer's store, but Overstock had them for so much less. They're stunning and match the drawer pulls perfectly. Win! Very well made, heavy pulls. The pills have been up for a few months and seem to be holding up quite well. Occasionally, I have to straighten them slightly in the cabinet doors but otherwise I would purchase again! These are beautiful, nice and heavy. The finials do loosen a bit at times, but not a worry for me. These are beautiful and classy looking. They really look nice on our cream kitchen cabinets. Our only complaint about them is that they easily come loose/unscrewed. The top and bottom of them also unscrew easily. We solved the problem by using locktite on them. Fabulous. We went to Home depot and they were almost three times the price. A great knob. These are beautiful. They are heavy weight and feel very solid in your hand when you grip it. 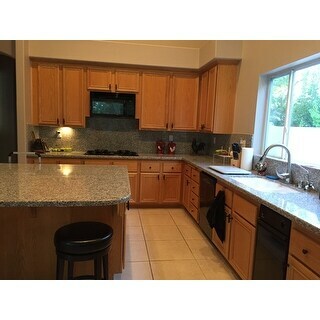 The color/finish is beautiful and would work in all but the most modern of kitchens. So classy looking in my new kitchen. Go well with my copper kitchen accents and bronze faucets. "what is the diameter of the base"
"Does this style come in brushed nickel or stainless steel?" Unfortunately, this exact model is not offered in additional finishes within our inventory. "I only need 31 of these knobs, but if they only come in packs of 10 then I am buying 9 extra knobs. Is there any way to purchase a few singles?" Hello JulesH, unfortunately, this knob is not offered as a single. Please let us know if you have additional questions. Thanks for shopping with us! I found extras to come in handy. I used them in the bathroom and laundry as well as the kitchen. "Can these pulls be used on kitchen cabinets? They are so different looking." Hello Mrs2513, this item can be used with kitchen cabinets as well. Thank you for shopping with us. I CHOSE THIS PRODUCT BECAUSE I AM REMODELING MY HOME AND THESE KNOBS WILL BE PLACED IN BOTH MY BATHROOMS. I have these knobs and I needed to find some to match what I have. I found them here for a great price!